Val's Quilting Studio : Tuesday Archives #27: FMQ & Funniest Quilt Made! Tuesday Archives #27: FMQ & Funniest Quilt Made! 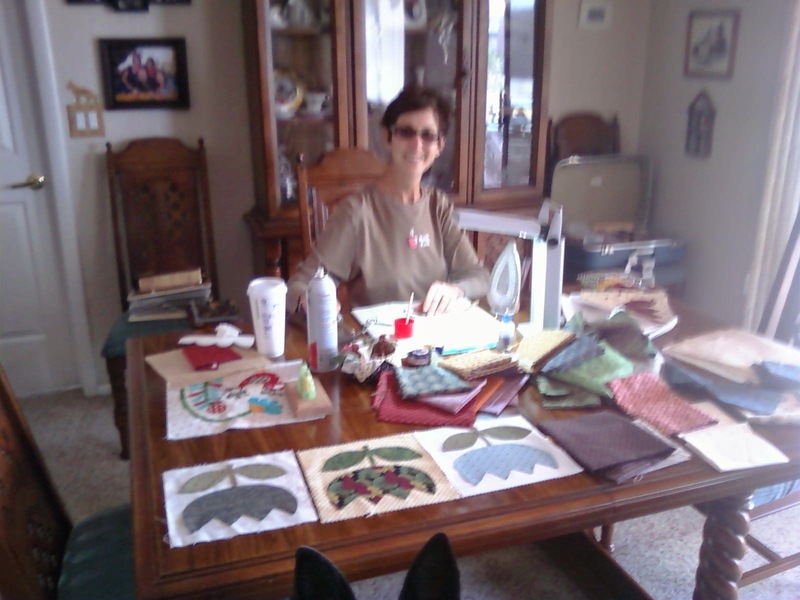 Welcome to the linky party that let's you rejuvenate your old quilting/sewing posts! that showcase your Free Motion Quilting & your Funniest Quilt made! Heck, feel free to make a new post about this one if ya want! I am always to very inspired by the FMQ work of Hilary Florence. Everytime I stop by her blog I'm amazed! If you've never stopped by Hilary's blog and are learning to FMQ...give it a peek. She just makes me want to "play"with FMQ more! FUNNIEST QUILT YOU'VE EVER MADE! I remember having so much fun making my little applique tulips and constantly picking out new fabrics for the flowers. I was always on the hunt for varieties of green and cream/tan toned fabrics. I am grateful I decided to machine sew these. 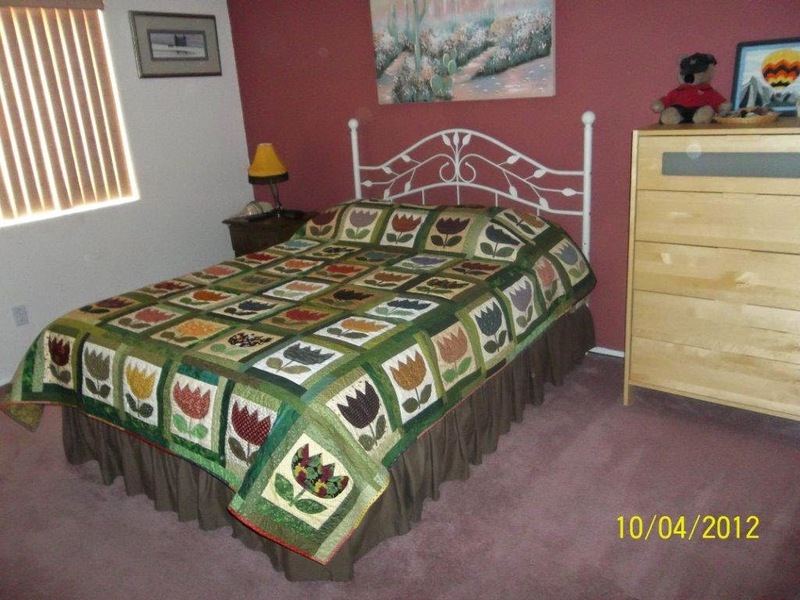 Your tulip quilt is more than just a quilt Val, with all those lovely memories! It looks great in your Mom's room too! I have to admit, your comments make me smile! Thanks for sharing and for letting me know you stopped by. I Hope your day is awesome! Our year to be authentic! This will help me finish my Lori Holt Picture quilt this summer! Either way, THANKS for following! Tuesday Archives #29: Ghastlies and Ghosts! Tuesday Archives #28: FREE Choice Week! I'm a Pets on Quilts Winner! Some us like to save our pennies! Click on the picture above. I May Have A Scrap Problem... Some Inspiration! We made it to Arizona! Mini wonders table runner is a top! 6 Days Until Quilt Week: Mission Impossible, Vintage Repair + New Tumbler Top All Ready for Quilting! All Aboard the Accuquilt Express! Happy Spring! I'm in Need of Opinions! Showing my wings, maybe not? A Star is Born. Sorta. Aurifil Designer BOM, RSC Blocks, and a Spring Quilt Along! NEW Book!! !...Introducing FARM GIRL VINTAGE 2!! Click the picture above for details. Copyright 2013 Valerie Reynolds. Feel free to link back to my blog but please don't copy content without my permission.